Hold on to your skulls! 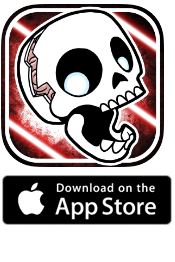 ClutchPlay is pleased to announce that our newest game “Skullduggery!” is available TODAY as a universal app on iOS for iPad, iPhone, and iPod Touch, and is featured as the Apple Editor’s Choice for the week of October 9th! This entry was posted in Blog, Games, News on October 8, 2014 by jcw. We are thrilled to announce that our new game, “Skullduggery!” will be hitting the App Store one week from today! Prepare your iPads, iPhones, and iPod Touches, and hold on to your skulls! It’s been a long and eventful year, and we couldn’t be more excited to share this strange and unusual little game with you. This entry was posted in Blog, Games, News on October 2, 2014 by Amy Dallas. The Tax Man Strikes Early! ‘Skullduggery!’ Selected for the PAX 10!